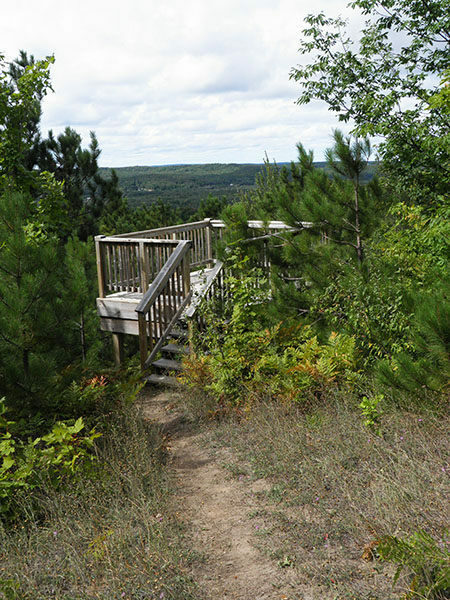 Located just southeast of Petoskey, the Skyline Trail is a short hike to an observation deck with a view of the rolling country of Bear River Valley in Emmet County and Lake Michigan. At 1,200 feet in elevation the view can be dramatic when enough leaves have fallen. The trail is part of the North Country Trail and nearby is a free-use shelter. 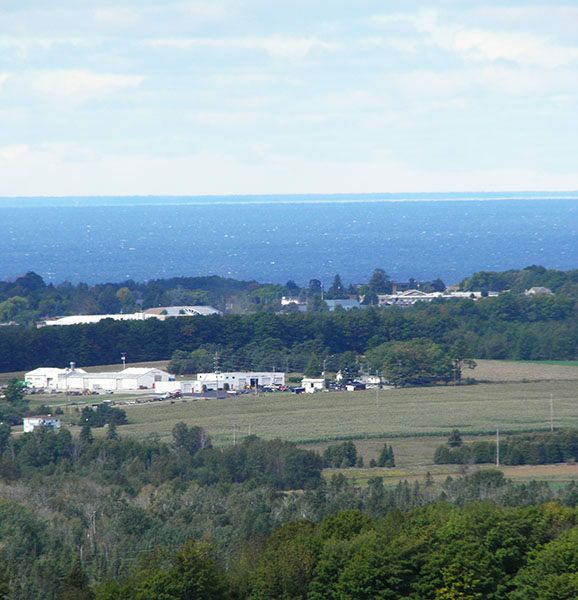 Located just southeast of Petoskey, the Skyline Trail is a short hike to an observation deck with a view of the rolling country of Bear River Valley in Emmet County and Lake Michigan. At 1,200 feet in elevation the view can be dramatic when enough leaves have fallen. The trail is part of the North Country Trail and nearby is a free-use shelter. The first half of the hike is a steady downhill trek of only 0.7 mile to the deck. You then turn around and climb the steep ridge back to the trailhead off of Krause Road. 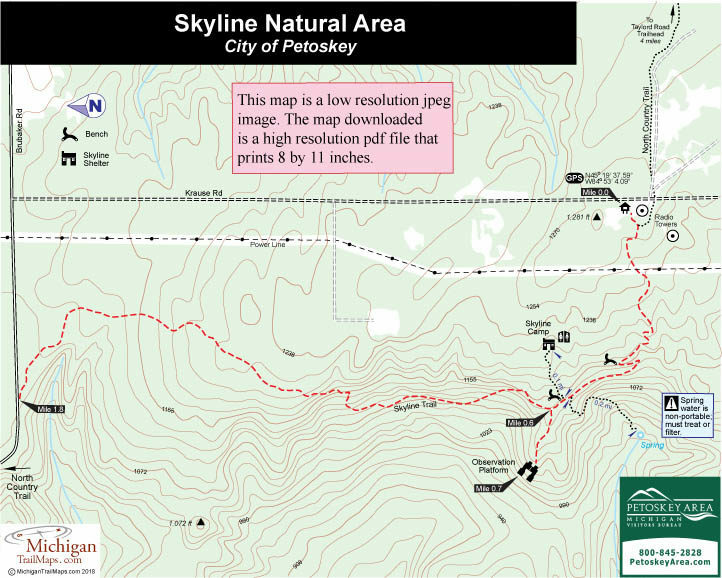 Most of the trail is on 65 acres of land that was acquired by the city of Petoskey with help from the Little Traverse Conservancy and a grant from the Michigan Natural Resources Land Trust Fund. For the most part the trail is considered the 1.8-mile path that stretches from the Krause Road trailhead to Brubaker Road. Continuing in either direction is the NCT. Skyline Trail is also open to mountain bikers and makes an interesting adventure in the winter on snowshoes to obtain the best possible views from the observation deck or even the Skyline Shelter. The trail departs the parking area and immediately comes to a junction with the North Country Trail. Head right and begin the descent. You pass underneath a power line, where it pays to keep an eye out for blackberries and wild raspberries in late summer, and then enter a red pine plantation. The descent gets more serious now and the trail even uses switchbacks, something you don’t see too often in Michigan, to drop down the side of this commanding ridge. At Mile 0.4 you arrive at a bench. The trail continues to descend via switchbacks and within 200 yards arrives at a second bench that marks the junction to the spur to Skyline Camp. 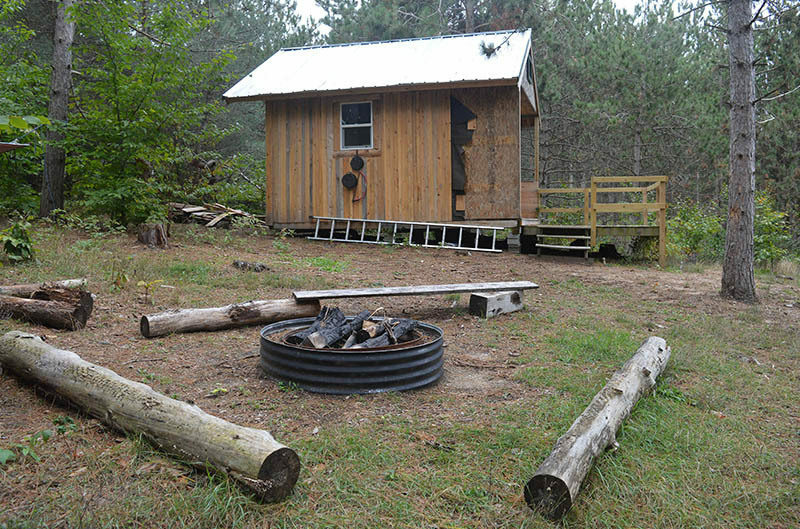 The camp is a short but steep uphill climb to the free-use shelter, fire ring and a vault toilet. 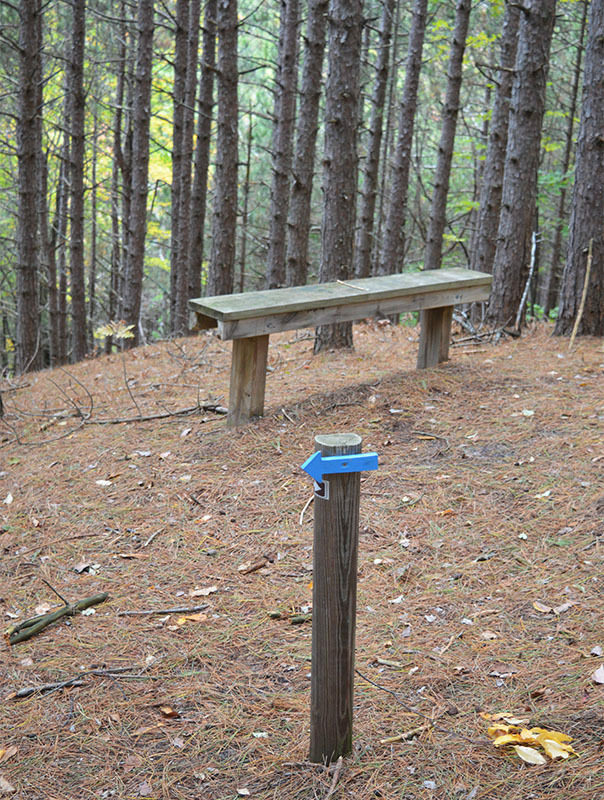 Just beyond the bench or at Mile 0.6 is the posted junction where the North Country Trail continues straight while a short spur heads left to the observation platform perched on the side of the ridge at 1,072 feet. Trees and their foliage block part of the view for much of the year but you can still look out over rolling farm fields, other ridges and a large slice of Little Traverse Bay. For the viewing deck junction the Skyline Trail continues to sidle the ridge briefly where the ruggedness of the area is very apparent from the steep-sided view you have from the path. Within 200 yards the trail makes a major descent towards the lower elevation of Brubaker Road and then levels out for a spell a half mile from the viewing deck junction. You make a final descent of almost 150 feet before popping out at Brubaker Road at Mile 1.8. If you're returning from the observation deck then the trek is simply an uphill hike back to the trailhead, gaining almost 200 feet in elevation. Be thankful you’re not following the NCT and have to shoulder a backpack along this stretch. 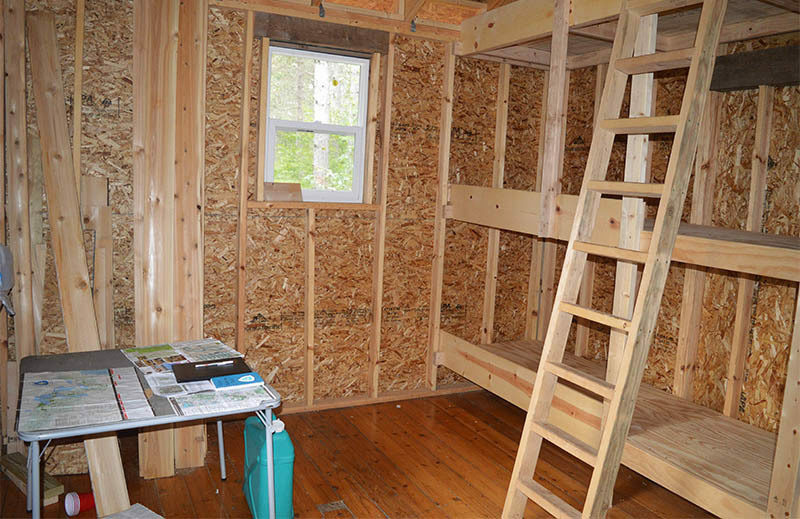 After a yurt collapsed under the weight of a heavy winter snowfall, the Jordan Valley 45 Chapter of the North Country Trail constructed a 12 by 13-foot shelter in 2017 featuring two windows, six bunks and a deck with a partial view of Bear River Valley. The cabin is at Mile 612.5 of the NCT but only a 0.6 mile from the Skyline trailhead. Use of the shelter is free but there is a two-night maximum stay. Right before the junction to the shelter is a spur on the Skyline Trail that heads south (left) off the ridge and is marked by white blazes. This is the 0.2-mile trail to a spring. It's a steep descent to the spring and the water should be filtered or treated. There are no vehicle fees for the Skyline Trail. From US-31 in Petoskey head east on Mitchell Street for 1.7 miles and then south (right) on Division Street for 0.8 miles. Turn east (left) on Atkins Road and 0.5 miles turn south (right) on Cedar Valley Road. Follow Cedar Valley Road for 0.5 miles and turn east (left) on Greenwood Road and follow it for 1.5 miles as it around a curves to the south and comes to a four-way intersection. Continue south onto Brubaker Road and in a mile turn west (right) on Krause Road. Within a mile the trailhead parking area will appear on the right and be marked by a North Country Trail sign. For more information contact for the Skyline Shelter the Jordan Valley 45 Chapter of the NCT or the Petoskey Area Visitors Bureau (231-348-2755, 800-845-2828; www.petoskeyarea.com).